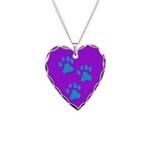 Jerry’s pack is proud to announce a wide selection of new Tripawds Jewelry! 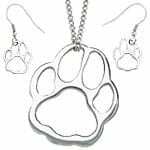 Check out the Jewelry page here in the Tripawds Gifts blog for a preview of various styles to choose from. The new Tripawds Esty Store includes a variety of fun charm necklaces hand made by Jim and René. Available with free leather cords, or stylish silver snake chains, these vibrant designs sparkle through thick glass tiles in assorted shapes. When Café Press announced their new jewelry, we created a colorful collection of necklaces and earrings now available in the new Tripawds Jewelry Store. 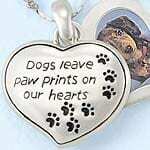 We’ve also added a selection of beautiful pet memorial pendants and lockets from Heartsmith to the Jewelry page. 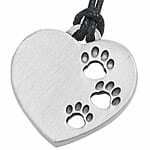 Choose from an engraved Sterling Silver paw print pendant to various different lockets suitable for your favorite puppy photo, or receptacle necklaces for keeping remains close to your heart. While we were at it, we scoured the interwebs and have selected a variety of pet themed necklaces, and breed specific jewelry perfect for any dog lover. So don’t miss the new Jewelry page for more recommendations and stay tuned for details about each of these exciting new offerings. 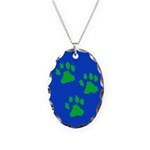 Check the Tripawds Esty Store often for new handmade creations from your friends here at Tripawds! Very pretty tripawd designs! Those are special!